My usual measure for rating a book is by how well it sticks in my mind after reading it — the good ones keep coming back, with little episodes and events and turns of phrase coming to mind again and again in response to anything that might jog my memory, whereas the bad ones sink without trace. Another measure is how many times I think “I wish I’d thought of that” while reading it. And I have to say, in both regards this one scores pretty high. The structure is pretty unique, at least as far as anything I’ve read in the past is concerned: six separate stories, spanning a period of hundreds of years from the nineteenth century to the far future, all with hints of deep-running links — up to and including outright reincarnation — threaded between them. Each story is split in two, and the way Mitchell has presented them makes the book a bit like climbing a mountain — moving from one half-story to the next in chronological order for the first half of the book is like climbing up, then reading the last half of each one in reverse order is like climbing down again, ending up at base camp back in the nineteenth century Pacific Ocean where we started. One nice feature of this was that I could remember the good bits from a particular story on the way up and look forward to seeing those same characters and settings on the way down. However it did mean that despite there being unresolved plot issues in all of the first-half stories, once the summit was reached, in post-apocalyptic Hawaii, it felt like a conclusion in its own right had been reached (and a rather depressing conclusion too with civilisation destroyed and a mediaeval society being all that remained). In fact I remember thinking at that point that the second half had better be damn good to justify the word count involved in finishing off each of those stories, one by one, knowing that in terms of setting and period we were going to end up right back where we started in the nineteenth century, possibly feeling as if we hadn’t progressed anywhere at all. However, despite forgiving the slow start, it would have been nice if the protagonist could have protagonated just a little more as things went on. As it is, he seems more of an observer, writing in his journal every day as events happen around him. The closest he gets to acting on his own is when the sailor Rafael hangs himself and he resolves to confront those who drove him to it, but even this doesn’t get very far. And even when he realises that Dr Goose has been poisoning him rather than treating him, it falls to his friend Autua to rescue him and carry his unconscious body to a hospital at their destination. All in all, I’m not sure this part of the book would stand up as a story in its own right, and only survives by being part of the bigger whole. Then the second story, Letters from Zedelghem. We’ve moved on a few years now, but the style of this one is similar to the previous section in that we’re seeing events through the writings of the protagonist, here Robert Frobisher, in this case writing letters to his friend Sixsmith. And our hero this time really does have a story worth following as he journeys across Europe using his last remaining funds to get to the home of his hero, the composer Vyvyan Ayrs, so that he can coax the great man out of retirement and take a place as his apprentice. The friction between the two of them is handled brilliantly, right from the word go, as Ayrs first resents then depends on Frobisher, then ultimately steals his ideas and compositions. And all the while Frobisher has a masterpiece of his own formulating in his mind, the work he knows will be his greatest — the Cloud Atlas sextet, a musical composition for six instruments, and our first hint of what the book’s title might actually be referring to. By the time this story has completed its second half, Frobisher has finished his work and taken his own life, having in the process found Adam Ewing’s journal from the previous section sitting in the Zedelghem library (the first half) and propping up his bed (the belatedly discovered second half). I’m not sure Mitchell really needed to put events into the story itself to explain why he as the author had chopped things up the way he had, and this certainly isn’t the only example where something in one of the stories explains why another of the stories comes in two halves, but if he felt the need to justify it then it certainly doesn’t detract from the book. Interestingly though there are hints that Frobisher doubts the authenticity of the journal, given the way it’s written and structured. I’m not sure if we’re meant to read anything into his comment, but the idea that some of these six stories are actually fictions within others, as opposed to all existing in the same reality, is one that crops up a few times through the book. Having enjoyed the slow start earlier on, the third section, Half-Lives — the First Luisa Rey Mystery, really was a page turner from the word go. This was real, gripping thriller material, a kind of China-Syndrome-meets-The-Pelican-Brief as we follow the journalist Luisa Rey after a chance encounter with nuclear physicist Rufus Sixsmith (the same Sixsmith that Robert Frobisher was writing to, now much older) leads her to risk her life uncovering a conspiracy to go ahead with the construction of a flawed nuclear powerplant and wipe out anyone who might try to raise the alarm. I read this part of the story avidly, trying to distil in my mind (as I always do when something grips my attention so well) what exactly it was that made it so good so that I can hopefully one day put whatever it is to use in my own writing. It was only in the second half that the jeopardy started to come slightly too thick and fast as the power company’s hitman, Bill Smoke, started to take on an almost supernatural ability to pre-empt Luisa’s every move, at one point beating her to a bank’s deposit vault where Sixsmith had hidden a copy of the crucial report, despite the fact that Sixsmith had arranged for Luisa to get the key and the box number in ways which no one should have been able to intercept. It reminded me of certain series of 24, usually around hour eighteen or nineteen, when the writers have to start pulling bigger and grander predicaments out of the bag to keep the tension up, despite the near-impossible sequences of events that would have to have happened behind the scenes to make them happen. In this way Bill Smoke is almost the devil incarnate, able to know anything and appear from anywhere, which I’m not sure was a deliberate part of his portrayal. Sixsmith himself though, despite being so short-lived, comes across very well as the kindly but principled old man that Luisa meets in the lift, and who Frobisher chose to confide in all those years ago. Then we get the fourth story, The Ghastly Ordeal of Timothy Cavendish, the story of a bumbling vanity publisher on the run from the brothers of a low life mobster who think they are owed the profits from the life-of-crime best-seller their brother wrote (before throwing the writer of a disagreeable review over a balcony — a warning to us all). Of the six, this seemed the odd one out — a readable, humorous tale, but seemingly out of place amongst the stories of exploration, masterpiece creation, the fight against corruption, and the future of the human race. This story had more of a comic edge to it than the previous ones, for the most part from the narrative voice of Cavendish himself whose descriptions of everything from British railway ticketing and punctuality to his experiences in the care home he’s tricked into inhabiting, sound like something from an episode of Grumpy Old Men. And as such it made for a great read — his description of the “Undead” he has to live amongst in Aurora house was brilliant, his cries of “Soylent Green is people! Soylent Green is people!” as ranks of Undead watch him from the dining room windows were hilarious, and the bit where he and his co-conspirators escape through the gates in the Range Rover only for Mr Meeks to appear, gibbering and twitching in the luggage compartment, had me almost dropping the book with laughter. However I have to admit to feeling a slight twinge of disappointment when it turned out that the whole Luisa Rey story from the previous section was actually fictional, taking the form of a novel manuscript that Timothy Cavendish is sent just before he flees. Even the author is named, a Hilary V. Hush. 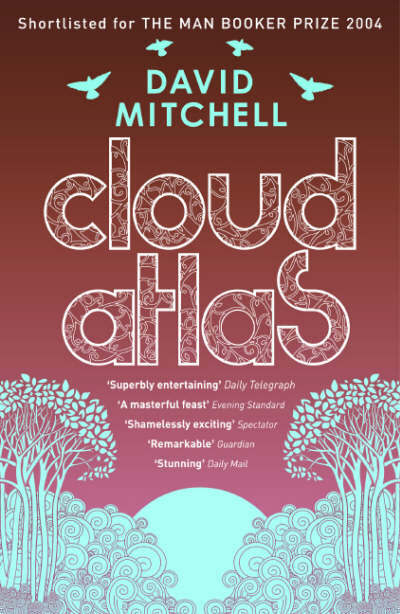 I’ve thought about this, and I really can’t put my finger on why this seemed such a disappointment, the idea that Luisa Rey’s adventures were somehow less real, because after all Cloud Atlas is itself a work of fiction. However the idea that the part of the story which had so far gripped me the most was actually one degree further removed from reality than I thought it was, felt like a bit of a let down. However there are some interesting implications to the way Mitchell has done this. For instance if Luisa Rey is a fiction within Timothy Cavendish’s world, then by extension the life of Robert Frobisher and his letters to Sixsmith — and the travels of Adam Ewing before that — are too. In fact to an extent they even figure in the Luisa Rey story — she obtains and reads the letters that Frobisher sent Sixsmith, and only gets to read the full set when Sixsmith’s niece gives her the second half (another device to explain the way the stories are split). However although Luisa (a fictional character two steps removed from our reality) would have read the letters in their entirety and would be aware of Adam Ewing’s journal, Timothy Cavendish and any other reader of Hilary V. Hush’s novel (fictional characters one step from our reality) would only learn of the existence of the letters, without seeing their detailed content — i.e. Adam Ewing’s journey would be unknown to them (note that Luisa does actually encounter Ewing’s ship, the Prophetess, at the harbour at the end, but makes no reference to its significance). I hope that all makes sense — the links between stories and between fact and fiction get quite convoluted here — but in essence it almost seems as if Mitchell is playing games with the idea of fictional characters having backgrounds and entire histories (histories not just of their own lives but of those who lived before them) which are every bit as “real” as those of the people who invent them and read about them. In other words, every time a writer invents a fictional character and a setting for them to live in, an entire world history springs into being spanning whole generations. It reminds me of something Tolkein said about reaching a point where he was not so much inventing Middle Earth as exploring it and finding out about it for himself — not the ravings of a deluded madman, but the words of a gifted author whose make-believe world has effectively become real due to his sheer skill at invention. Then we have the first of the future episodes, the fifth story of the six, An Orison of Sonmi ~451. The future as presented here sounds hideous, starting within the confines of Papa Song’s fast food outlet where shark gums and rosewater seem to be typical offerings, then moving out to the wider world as we follow the genetically engineered service fabricant Sonmi ~451 who has been plucked from her menial existence after being put through a drug-assisted “ascension”, or rise to sentience. The setting itself is far from original — it reads like Brave New World (with Sonmi ~451 as one of the vat-bred gammas or deltas) crossed with Soylent Green (with the gammas and deltas as lunch) — but it was the use of language that really impressed me, the new words and names for things that were both plausible and immediately recognisable (something of a requirement if fictional worldbuilding isn’t going to be plagued with info-dumps — facescaping, dewdrugs and amnesiads were good examples, though to be honest the constant use of “x” words such as “xultation” and “xplained” did come across as a bit corny). Sonmi ~451 herself comes across well as the confident, self-aware narrator of events which for her started in a confined world of drug-induced amnesia and servitude — both her old and new sides are portrayed very well by her words. However I did think the use of the word “soul” for the electronic ID implant that purebloods use was signposting their relative status a little too strongly — fabricants don’t have souls, therefore fabricants don’t count as people. The way the world is presented to us got that message across very well on its own. One thing that particularly struck me was the reckless and irresponsible nature of some of the purebloods in this society, the high caste citizens who should have been paragons of learning and civilisation. Instead, as illustrated by crossbow-wielding PhD-cheating Boom Sook Kim, they were more like parasites, lucky to have been born into the peak of man’s civilisation while incapable of contributing to it themselves. It stood out for me as a good foretaste of The Fall that was to be a feature of the next section (and when Meronym went on to give her speech on how people’s civilised side differs from their savage side, it might as well have been Boom Sook Kim she was referring to). But then we find out the whole thing was staged, to Sonmi ~451’s belief anyway, a way of bringing an ascended fabricant into being, showing the public how dangerous they are, and securing even more leverage to control them and keep them in their place. So does this mean that Boom Sook Kim was in on it too? It hardly seems credible unless some government agent was playing the part of this waster, but then how else would a PhD project like that be allowed to go ahead? And was the killing boat with its undertones of Soylent Green a sham too, fabricated to shock Sonmi ~451 to the core? If not then the authorities have knowingly given away the most dreadful secret of their system when there’s no reason to go this far just to set Sonmi ~451 up as a puppet enemy of the state, but if it is a sham then that means the retirement of fabricants to a Hawaiian paradise might as well be true — is it any coincidence that the next section takes place there, with a society who worship Sonmi as their deity? The killing boat certainly produces a rare emotional response from the archivist Sonmi ~451 is talking to, who would themselves be a loyal member of society. If the secret is that dangerous, it’s going to be worth keeping safe. I’m also forced to wonder just how much of the world was set up like the society of Nea So Copros (which we come to learn is actually Korea). Maybe the news stories surrounding Hwang Woo-Suk, the Korean researcher who claimed to be on the brink of cloning humans in 2005, was what prompted this setting, but does the whole developed world work this way? Certainly when the Mauna Kea observatory turns up in the next section, it doesn’t appear to have spent the years before The Fall being staffed by pureblood masters overseeing fabricant menials (no Soap rations lying around or bodies with barcode collars). It’s a remnant of our world, not Sonmi ~451’s. So moving on to this final section of the six, Sloosha’s Crossin’ an’ Everythin’ After. It’s no mean feat to develop an entire, self-consistent dialect and then write however many thousands of words in it, but this section with its babbits and yarnies and rampant mukelung did just that, as well as any Clockwork Orange or Feersum Endjin. However it was hard to imagine this particular dialect appearing in post-Fall Hawaii of all places. I’m not sure what I would expect it to sound like, but as written here it sounded like something from rural England or the Eastern US (Deliverance country). I particularly liked the relationship between Zachry and Meronym — his initial mistrust of her, the way he slowly comes round, and her the calm, easy way in which she accomodates his mistrust, never confronting him directly but never allowing herself to be cornered by him and his accusations. That she is a representative of the last vestige of civilisation in this post-Fall world comes across loud and clear. As for the Fall itself, it sounds more like the natural decline of a decadent self-indulgent society rather than the result of any particular war or catastrophe (in fact having heard that part of the book had a post-apocalyptic setting I read the Luisa Rey section thinking that the eventual failure of the HYDRA reactor might be the culprit). As it is there is a lot of hidden history between Sonmi ~451’s section and this one; for instance the fact that the drop-out society that gives Sonmi ~451 a home is headed by an “Abbess”, and Zachry’s society on Hawaii is too, can’t be a coincidence. I’d also like to know just who “Georgie” is supposed to be, the ephemeral character Zachry and all other Valleymen are afraid of. That he’s their devil seems obvious, but is he based in a real person the way their deity Sonmi is? He’s described as being the one who precipitated The Fall — was there a real-life George who set those events in motion? And what is the mystery disease at the end that kills off even the Prescients, those few who keep going what little of our technological society remains? It seems to come out of left field, and I racked my brains trying to think of some foreshadowing of it in the preceding sections (right back to Adam Ewing’s cerebral parasite, before it turned out to have been a fabrication of Dr Goose). Something that big needs to be foreshadowed in some way, and unless I’m being unobservant, it wasn’t. The unusually accurate predictions of the Abbess when interpreting Zachry’s dream left me wondering too. Just how did she come up with three warnings which so accurately matched events in his future? And the fact that for the second one he ignored the instruction completely by cutting that Kona warrior’s throat — were there any consequences to be faced there? Either there is something profound behind the predictions (and in a world where reincarnation occurs that certainly can’t be ruled out) or there isn’t — but if there is, then breaking commandments and ignoring prophecies needs to carry a penalty, and as far as I could tell there wasn’t one. A nice conclusion was reached though when Meronym gave her account of what makes civilised people different from savages (both have the same needs, but a savage fulfils that need in the now, whereas a civilised man plans for the future). It’s necessarily over-simplified given that she’s talking to Zachry the Valleyman, but it puts everything that’s gone before into perspective — all those episodes where people’s desire for power and status, be they Seaboard power executives or Bill Smoke the hitman or Boom Sook Kim — only led to ruin. As for the book as a whole, what was it trying to be? There’s clearly more to it than just a showcase for how many different styles Mitchell can write in. “Revolutionary or Gimmicky?” is the question Robert Frobisher asks when planning his sextet, and it’s clear that Mitchell was asking the same question. I felt quite pleased with myself when I figured out early on that reincarnation was at the heart of it, first when the comet-shaped birthmark turned up on Frobisher then Luisa, then when the Abbess made her comment to Zachry (“souls cross ages like clouds cross skies”). Later on the references to reincarnation are more overt (I’d have been tipped off even earlier if I’d read the back-cover blurb), and Tim Cavendish actually comments on the possibility when reading Luisa’s story. It’s interesting though that the birthmark, and therefore the chain of reincarnation, seems to span the fact:fiction barrier given that Ewing, Frobisher and Luisa sit within the pages of Tim Cavendish’s latest submission (linked to each other by journals and letters that each one writes to be read by the next), while he, Sonmi ~451 and Meronym sit outside them, with only the very surface of that fictional world is visible in the Luisa Rey novel itself (Sonmi ~451 does see a film of Cavendish’s life — in two halves again — but Cavendish talks about getting his life story filmed so I still think he and Sonmi ~451 inhabit the same reality). In fact there seems to be a 3:3 split between which level of reality the different story strands sit in, and I can’t help wondering if there’s anything significant in that, the way the fact:fiction barrier sits halfway through the sequence. It’s difficult to comprehend a character being the reincarnation of someone who to them is entirely fictional, so all credit to David Mitchell for tying my brain in knots with that one! I also wondered whether the chain of reincarnation goes back in time and further into the future than what we see here — possibly not given that the comet birthmark has six tails: six tails for six incarnations? It may be that what we see in the book is the entirety of this soul’s existence. As for any deeper meaning, the words of Isaac Sachs before his plane is blown up have to have some significance: his musings on how the recollections of an event like the sinking of the Titanic become, through the process of telling and retelling, something distinct from the event itself, to some extent taking over as the “real” version of events once all those who experienced it directly are gone, and how the same could be said for the future as people’s anticipation of how things will happen lend those imaginings too a reality of their own. Crossover between fact and fiction in a book with a fact:fiction barrier all of its own? Questions of what’s real and what isn’t? Mitchell is definitely telling us something here about how the six stories, and the realities they seem to exist in, should be viewed. There are other things too, little links between stories that seem to act as little signposts. For instance the way “Nea So Copros” is the country where Sonmi ~451 lives, and the existence of copros plantations on the islands Adam Ewing visits; then we have the references to hydra, both in the name of the reactor design Luisa Rey is fighting, and in Sonmi ~451’s story (a six-headed hydra if I remember correctly); then there’s a Dr Upward in the Timothy Cavendish story and a Father Upward who is mentioned in Adam Ewing’s story; then the Swannekke tribe that Meronym describes to Zachry and the Swannekke setting for Luisa Rey — the list goes on. There are also two Adams: Adam Ewing himself at the start, and Zachry’s brother Adam who disappears in the final section. I couldn’t help speculating about a circle of reincarnation, but I don’t think that’s the case. Seeing the same name twice though — is it really a coincidence? In fact I can’t tell if we’re meant to be following these clues like some kind of paper trail, or if they’re just there to tie the stories to each other even more tightly than they already are — and after all I’d have to reread every word to get them all. But for me the book is like a puzzle to be unravelled, a set of tangled chains of cause and effect and influence where the progression of this reincarnated character goes from place to place and time to time, leaving a trail of documents and evidence behind them. And the fact I’m still not entirely sure I’ve figured it all out doesn’t detract from having enjoyed it at all. Plus (as far as I’m aware) it’s the closest thing we’ve ever seen to an SF Booker Prize winner. As I said at the top, I’ll be thinking about this one for some time to come.